US, 1975, 91 minutes, Colour. Gene Wilder, Madeline Kahn, Marty Feldman, Dom De Luise, Leo Mc Kern. The Adventures of Sherlock Holmes' Smarter Brother is partly funny, frequently silly, mildly enjoyable if your mood is right, otherwise it could be annoying. Sherlock Holmes and his fictitious bungling brother are given the broadly unsubtle American treatment when characters, locations and situations cry out for British restraint and wit. Actors like Marty Feldman and Madeline Kahn are very good, almost despite their material. 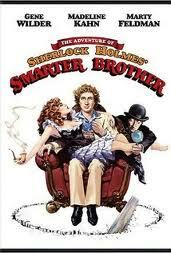 Gene Wilder is too, but the trouble is that he is not only responsible for the material in writing the screenplay, he also directed it. The original classics lose nothing by being cleverly spoofed. The classics here remain safe. It is just that the spoof is not satisfyingly clever. 1. The tone of the title, expectations, Sherlock Holmes, parody and satire? Expectations from Gene Wilder and Marty Feldman and their style of comedy? 2. The importance for enjoyment of interest in Sherlock Holmes, his reputation, the 19th century detective, his detective work? The mocking of Sherlock Holmes and the 19th century? 3. The appeal of the detective genre, Sherlock Holmes' status within this, his ability for detection, his analysis of clues, his style? How were these parodied and mocked? Appropriately? The quality of the laughter-style comedy, elements of parody, satire on the style and the genre and audience expectations, the type of schoolboy jokes and humour, eg. lavatory humour? A successful blending of these? Within the atmosphere of the late 19th century? The musical comedy touches and the songs? The introduction of Sherlock Holmes himself, Dr. Watson? Sigi and his dismissing him as Sheer Luck? The appearance at the beginning, at the end? 6. Gene Wilder's style as Sigi? The fiction of Sherlock's younger brother, the contrast with Sherlock, the jealousy? Being accident prone? The sheer luck of solving the case? 7. The case and its humour and ironies, as based on Conan Doyle's type of story? Nineteenth century atmosphere, London, Foreign Secretary, documents, spies? The introduction of Moriarty as villain and the confrontation of Sigi and Moriarty as villain and the confrontation of Sigi and Moriarty? How well did the film derive from the original? 8. The humour of the details of the case, the complications and twists, the introduction of characters, comic and farcical situations and Sigi's detection nonetheless? 9. The parody of the police force in Marty Feldman's performance as Orville Sacker? Feldman's style of comedy within the Sherlock Holmes context? Particular examples? 10. Madeline Kahn and her style of comedy, her flamboyant portrayal of Jenny Hill? Jenny as a character, with the Foreign Secretary, in herself, musical comedy, songs, deception, falling in love with Sigi? 11. The humour in the character of Gummbetti? Poking fun at his style? The Italian, singer, vain? His fight with Moriarty? 12. Leo McKern's interpretation of a comic Moriarty? The traditional villain, poking fun? The humour with Finney, eg. the chase with Sigi and their fight with the large boot and glove? Lord Radcliffe and the satire on the British Foreign Office? The contribution of the songs, 'The Kangaroo Hopped', the zany atmosphere the silly aspects of the comedy, the opera and the mix-up, the chocolates, the duel? 16. Sherlock's judgment at the end? The humorous spirit of mockery?